Phil Mickelson has won four major championships and forty events on the PGA Tour. Mickelson has been in the top-10 of the Official World Golf Rankings for over 700 weeks in total and has been ranked in the top 10 every year since 1996. He has never quite reached the World Number One spot but has often been rated second. Mickelson was elected into the World Golf Hall of Fame in 2011. He is currently rated 22 in the World. Mickelson won three NCAA individual championships and three Haskins Awards as a collegiate golfer. He won his first PGA Tour at the age of twenty in 1991 at the Northern Telecom Open in Tucson. He turned professional the following year and in 1993 won the Buick Invitational by seven strokes. He has remained a fearsome competitor on the PGA Tour, recording at least one victory each year apart from 1999 and 2003. He won the Buick Invitational again in 2000, bringing the record run of six consecutive tournament victories for Tiger Woods to an end. Mickelson has always been capable of producing a low score and carded a 59 at the PGA Grand Slam of Golf at Poipu Bay Golf Course in Hawaii in 2004. For many years, Mickelson carried the tag of the best golfer never to have won a major. Between 1999 and 2003, Mickelson had six top three finishes in majors including being twice runner-up at the US Open, a tournament in which he has now been second on a record five occasions. He finally gained an overdue maiden major championship victory in the 2004 US Masters. He went head-to-head with Ernie Els over the closing holes and needed an 18-foot birdie on the final green to defeat the South African. He finished with three consecutive rounds of 69 and became only the third golfer playing left-handed to win a major after Bob Charles and Mike Weir. 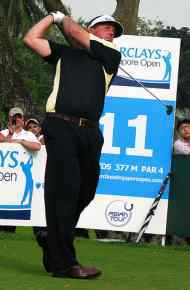 The following year, Mickelson secured a second major championship with victory at the US PGA Championship at Baltusrol. Once again, he had to produce something special on the closing hole to grab victory. This time, it was one of his trademark soft pitches from the rough that crept to within eighteen inches of the hole. The resulting birdie gave him a one stroke victory over Steve Elkington and Thomas Bjørn. In 2006, Mickelson won a second Green Jacket at Augusta, winning by two strokes from Tim Clark. This victory elevated him to a career-best second in the Official World Rankings behind Tiger Woods. He probably should have added a fourth major title at the 2006 US Open when he led by one stroke going up the last. A wayward drive and a poor iron shot eventually left him with a double bogey and tied for second spot. Had he made par, he would have joined Ben Hogan and Tiger Woods as the only players to win three consecutive professional major championships. Mickelson’s most recent major success came in the 2010 Masters when a score of 16 under par gave him a three shot victory over Lee Westwood. During the third round, the Briton had a lead of five shots but Mickelson produced an eagle and was only one shot behind at the close of play. That victory left Mickelson second only to Tiger Woods in terms of major championship wins among his contemporaries. He was tied for second at the British Open in 2011 and tied for third at the Masters in 2012, proving that he is still a leading contender at the major tournaments.